Lily is known for being the maker of Sugar’n Cream, which is probably most popularly used for things like dishcloths and washcloths. But that’s not the only thing you can use it for, as some recently released free patterns from the company illustrate. 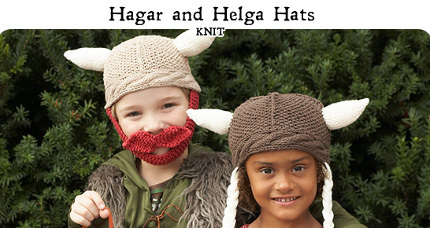 The Hagar and Helga (link goes to a PDF) hats are Viking-inspired hats that are perfect for Halloween costumes for your little ones. Hagar comes complete with a mustache and beard, while Helga has long braids. Both have helmets with horns. Of course you can still make Halloween-themed dishcloths while you’re at it: they have a really cute one that looks like candy corn (what is with all the knit candy corn?) and is worked in Seed Stitch (that one’s a PDF, too).